As many of you know, Facebook has been on trial lately for their failure to police their network, limit mischievous advertising, and filter out fake news. Recently, Mark Zuckerberg traveled to Washington D.C. to testify before Congress to ensure lawmakers that they're doing their best to try and fix some of these problems. While some may think this is a political witch-hunt, our best intelligence agencies have all come to the same conclusion, Facebook inadequately managed its network of 2.2 Billion users with regards to news and politcal content. It allowed news bots, often funded by international espionage agencies, to run rampant. These bots have spread fake news, preyed on people in order to inflame passions surrounding delicate political issues, and generally contributed to a souring of our political atmosphere. Last Friday, as our team went to launch the latest round of awareness ads for the primaries tomorrow, we were caught up in the Facebook Political Ad Filter. We've been supportive of Facebook's attempt to filter out the bad actors. Their efforts leave more room for legitimate political advertising and active conversation on the platform, while removing people and groups who are online to sow discontent. While we've been supportive, we assumed that because we had received no notification or other alert from the Facebook Team, that our platform had been identified as a legitimate political actor. As most of our users know, our ads are non-inflammatory by design. This keeps us aligned with our status as a non-partisan host for advocacy groups and a safe place for political activism for our users. That's why we were caught off-guard when we received this message as we went to push our ads urging people to go vote in the primaries: Undoubtedly, a new filtering system is bound to have some snags. In fact, there are quite a few articles like this, bemoaning either the method or the execution of implementing the filter, in circulation lately. To be sure, an advance notification that our group had been targeted would have been appreciated. We were unable to run our ads because the verification process includes a physical piece of mail that takes ~3 days to reach you. While we're disappointed that the ads didn't get to run, Facebook is striving to make a change, and we can show you a little "behind the scenes" on what that process looks like. After receiving the notification above, you follow the link to "Complete the Authorization process". Here, you are met with a few requirements. One is that you enable Two-Factor Identification. At first glance this seems extraneous to political advertising. But when you stop to think about it, this TFA will cut down on bot accounts, as well as supply Facebook with another piece of information (your phone number) for completing the background check. Once TFA is set up, you must enter a US Mailing Address where you regularly receive mail. This is where digital goes analog. Facebook sends you a letter (within a few days) with a 6-digit code you must enter to verify your identity. While slow, this process creates another barrier to entry for foreign groups wishing to exercise influence on political ads in the United States. Savvy readers are sure to point out that physical verification is not a panacea. Yes, it's fairly easy for a foreign group to register a US address and take mail there. However, this step is designed purely to make it more difficult, not impossible. While you wait for your letter in the mail (who ever thought we'd say that in 2018? ), there is one last step. 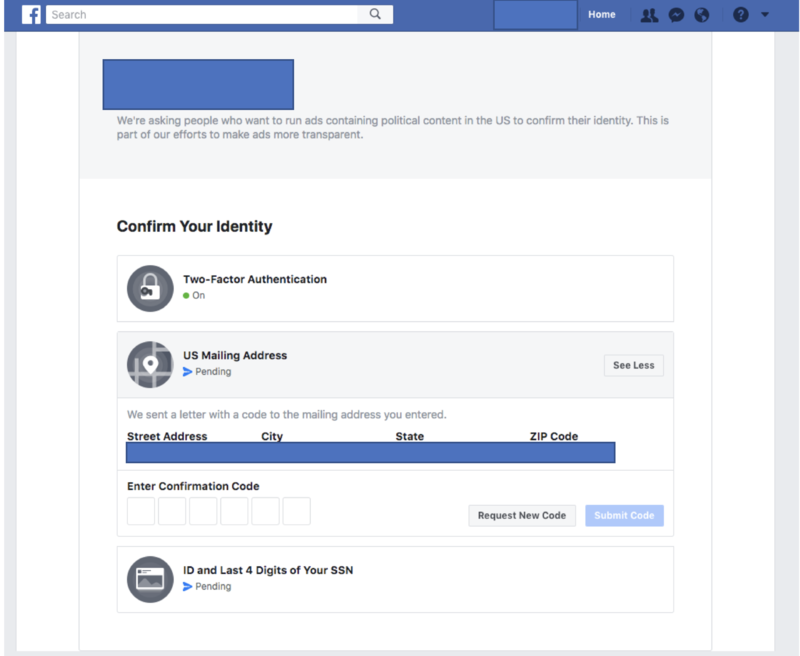 Facebook requires an ID in one of two forms, US Passport or Driver's License/ID Card combined with the last 4 digits of your SSN. Quickly take a photo and the system will determine if the ID is usable. Hopefully the system works well and we're back in business quickly. Stay tuned for updates as we have them! We'll update this post once our ID is verified and we're back in business! After a 5 day wait, we finally received our 6 digit pin. After inputting the code, we're back in business!